Chances are you have a craft beer lover (or two) on your holiday shopping list. This year, give the gift of Michigan beer, while also supporting locally-owned businesses and the state’s overall agricultural industry. Stop in your local microbrewery or brewpub and pick up a growler, four- or six-pack of a seasonal brew and build your own gift basket with a selection of brewery swag like stickers, buttons, t-shirts, home décor, bottle openers, gift cards and other unique stocking stuffers. A membership in the pub’s “mug club” would also be a nice offering. Many retail outlets around the state also feature Michigan-made brews, including 12-bottle variety packs or build-your-own-six-pack options which provide a more personal touch to your gift giving. Shop online at MiBeer for a variety of logoed items from the Michigan Brewers Guild. You’ll find everything from apparel, backpacks, tote bags, glassware, sunglasses, flags, license plates, beach balls, bottle openers, patches, pins, stickers, tin tackers, umbrellas and more. 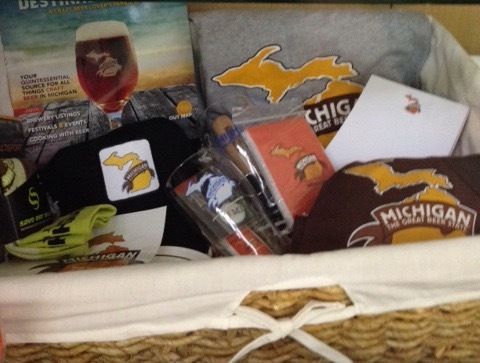 Michigan Brewers Guild Enthusiast Memberships also make great gifts, providing a year of benefits like pre-sale dates for the four official festivals and one hour early admission to each, dollar-off pint options at participating breweries, special brewery tours and an official Enthusiast t-shirt — all for just $55.